COLUMBUS, Ohio – While fall frost is an annual concern for livestock producers because of the potential for prussic acid poisoning, the potential for toxicity in livestock is perhaps of wider concern this year because of the drought that many livestock producers suffered, according to an Ohio State University Extension specialist. The drought of 2012 has been one of the worst on record in Ohio, leaving many livestock producers short on hay and silage supplies. The lack of substantial rainfall, extreme heat and dryness left many producers looking for any alternative forages they can plant to make up for the shortages, said Mark Sulc, an OSU Extension forage specialist. “This year especially with the dry weather, people were looking for ways to grow supplemental forage,” he said. 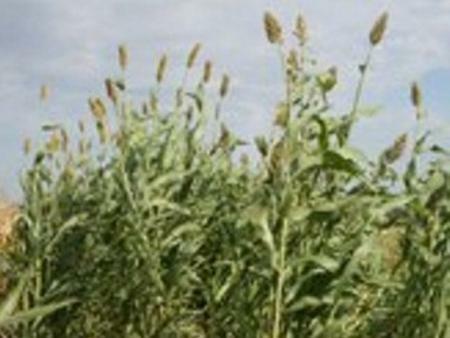 As a result, some chose to grow sudangrass, sudangrass hybrids, forage sorghums or sorghum-sudangrass crosses, which can produce excellent forage yields in a short time but are capable of becoming toxic to livestock after a frost event, Sulc said. These species contain compounds called cyanogenic glucosides that convert quickly to prussic acid in freeze-damaged plant tissue, Sulc said. The signs of prussic acid poisoning appear rapidly after the animal eats forage high in prussic acid content, because it interferes with oxygen transfer in the blood stream of the animal, causing it to die of asphyxiation. Symptoms include staggering, labored breathing, spasms, foaming at the mouth and convulsions. The concern is growing now since some parts of the state have already experienced frost, with the larger threat for frost statewide occurring around Oct. 4 or 5, according to Jim Noel, with the National Weather Service. Noel’s weather updates are featured in the OSU Agronomic Crops Team's weekly C.O.R.N. Newsletter. However, making hay and silage from these forages after a frost reduces the risk of poisoning, Sulc said, because prussic acid in the plant decreases during the wilting and hay-drying process. But hay or silage that are not properly cured and dried before bailing or ensiling should be tested for prussic acid before feeding them to livestock, he said. "Because prussic acid is a gas, the longer the gas has to dissipate out of the plant, the less it is dangerous for livestock," Sulc said. Don’t graze after a killing frost until plants are dry, which usually takes 5 to 7 days. New growth may appear at the base of the plant after a non-killing frost. If this occurs, wait for a hard, killing freeze, then wait another 10 to 14 days before grazing the new growth. Don’t allow hungry or stressed animals to graze young growth of species with prussic acid potential.